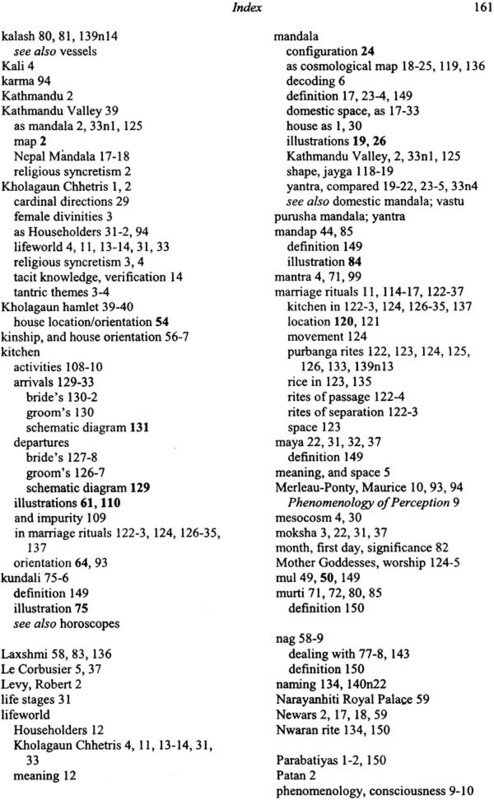 A rich and fascinating ethnography of domestic architecture and activities among the high caste chhetris of Kholagaun in Nepal, this book focuses on the spatial organization, everyday activites and ritual performances that generate and display Chhetri houses as ‘mandalas’, sacred diagrams that are both maps of the cosmos and machines for revelation. 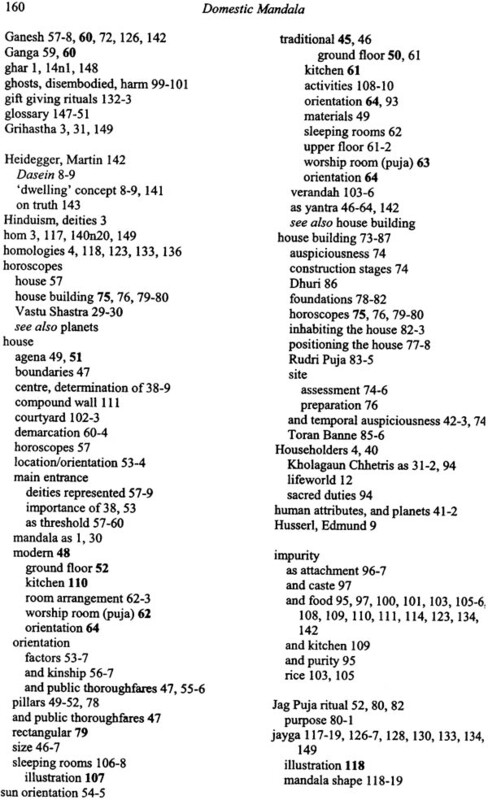 Describing the orientation and layout of the Chhetri house and surrounding compound: it shows how the orientation and distribution of everyday social activities with the domestic activities with the domestic mandala shape people’s experience of the enigmas of their lifeworld as householders; and analyses the double significance of rituals that take place in the domestic mandala. By treating the Nepali house as more than just the background of people’s everyday life, the author reveals the Chhetri everyday lifeworld as a revelation of Hindu tantric cosmology, its enigmatic illusion and the path to liberation from it. The themes addressed in the book make a unique contribution to the fields of anthropology, architecture and human geography. This book had its inspiration during afternoon teas with Vivienne and Alex Kondos in the gardens of the Ambassador Hotel in Kathmandu in the autumn of 2001. We had been friends for many years and had been doing anthropological research in Nepal since the mid-1970s. On those warm afternoons, we began to explore how we might bring together our respective research about high caste Hindus that, until then, had run parallel, sometime complementary, sometimes critical but always respectful, courses. This book's theme of the Chhetri house as a mandala is the fruit of those explorations with Vivienne and Alex. Over the following two years, I was able to take several short field trips to Nepal with the generous support of time and funds from the University of Adelaide and the Faculty of Humanities and Social Sciences. For the past four years, my colleagues in the Discipline of Anthropology patiently witnessed and willingly assisted me in my struggle to understand and articulate the tacit dimension of domestic architecture and everyday life in a domestic mandala. Rod Lucas again deserves special thanks for the time and effort he took to comment upon important sections of the manuscript. 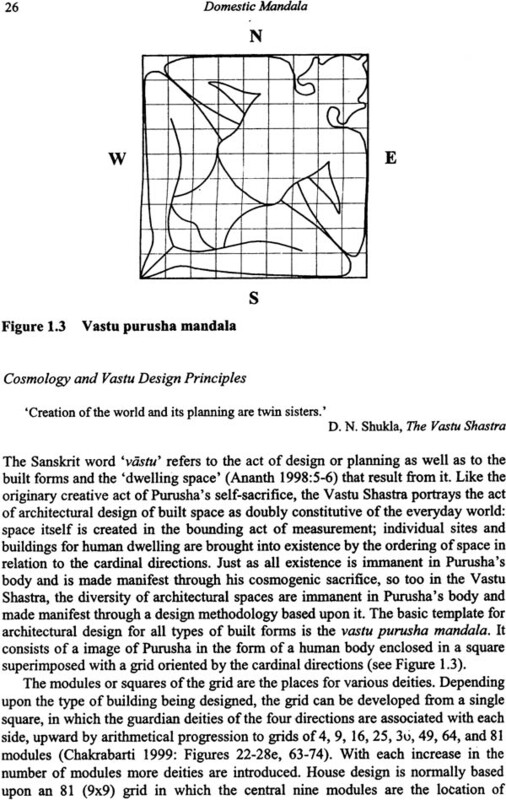 I also want to thank Tony Radford and Deborah White of the School of Architecture, Landscape Architecture and Urban Design, for providing architectural and ethnographic insights, Chris Crothers of the Discipline of Geographical and Environmental Studies for her talents in drawing the maps, and Vistasp Mehta for allowing me to use the image of the vastu purusha mandala. Karen Armstrong kindly invited me to the University of Helsinki to participate in a collaborative workshop on Memory and Place with Nancy Munn, Rupert Stasch, Timo Kaartinen, and Jukka Siikala. For me the workshop was a great success and I hope I was able to contribute as much to the work of the other participants as I benefited from their comments and insights. The hospitality of the people of Kholagaun and their continuing willingness to collaborate with me has spanned two generations so that for this project it was the children and grandchildren of my friends and neighbours who also contributed so much to my understanding of their houses and the life they carry out within them. In particular, Manoj, his mother, his wife and son invited me into the process of building their new house and patiently explained many of the rituals that accompanied its construction. I wish them, as well as all the people of Kholagaun, auspiciousness and well-being for their residence in their houses. It has been more than thirty years since Ashoke and I met, lived in Kholagaun and became more than just friends. Throughout my fieldtrips to Nepal, I have become a member of his household, joining his wife, Pushpa, and children, Pranai and Dipika. They also introduced me to their Baje who shared with me his deep knowledge of and reverence for Hinduism, horoscopes, sacred geography, and the aims and meanings of rituals accompanying domestic rites. I hope that my affection and gratitude to ashoka and his family are evident throughout the pages of this book. What could be more ordinary than houses and the straightforward mundane life that people live within them? Yet, the themes of this book are that underlying the ordinariness of houses are rich and complex ideas about the cosmos and that commonplace domestic activities are simultaneously cosmogenic acts of building the cosmos and revelatory acts of knowing its fundamental principles. I explore these themes through an ethnography about the houses of high caste Hindus of Nepal portraying their lifeworld as they live it, experience it and come to know its sacred cosmos through the activities they carry out in the taken-for-granted spaces of their dwellings (ghar). Rather than just a backdrop to their everyday lives (Wilson 1988), Nepali houses are mandalas (mystical diagrams) 'not just in daily life but also in the imagination' (Carsten and Hugh-Jones 1996:64). They are materially built, ritually constructed and practically con figured as functional spaces for domestic life and as sacred spaces that reiterate the nature of the cosmos so that living in these domestic mandalas is productive of knowledge of the cosmos they represent. As mandalas, houses are a context and a medium for daily life and for embodied knowledge of the cosmos in which that lifeworld is given meaning and significance. The people whose domestic architecture and Iifeworlds I describe are members of a Chhetri clan living in the hamlet of Kholagaun in the village (VDC2) of Banaspati located in southern reaches of the Kathmandu Valley (Map 1). Chhetri is the name of one of a set of castes-including high caste priestly Brahmin (Bahun) and Royal Thakuri and Untouchable castes including Blacksmith (kami), Tailor (Damai) and Leatherworker (Sarki)-that together are known in Nepal as 'Parbatiya' [literally 'hill people']. Parbatiya are descendants of high caste Hindus and associated Untouchable castes who immigrated from Northern India beginning in the second millennium A.D., spreading through the hill zones of western Nepal and in 1769 conquering and settling in the Kathmandu Valley (Hoffer 1979:43). Brahmins and Chhetris are the largest caste or ethnic groups recognized in the 2001 census representing almost sixteen per cent and thirteen per cent respectively of Nepal's total population of twenty-three million. Throughout the history of Nepal, high caste Parbatiya have been and continue to be dominant culturally and politically: Thakuri is the caste of the current Royal dynasty; Chhetris form a major part of the civil service and army; and Brahmin-Chhetri culture, including Hinduism and the caste hierarchy, permeates the social, economic, legal and educational fabric of the Kingdom. Religion and cosmology in the Kathmandu Valley, itself conceived as a mandala, are a complex syncretism of Buddhism, Hinduism and Tantrism. The Newars who are the indigenous inhabitants of the Valley and the builders of its three royal cities-Kathmandu, Patan and Bhaktapur-are highly syncretic in their religious beliefs and rituals. 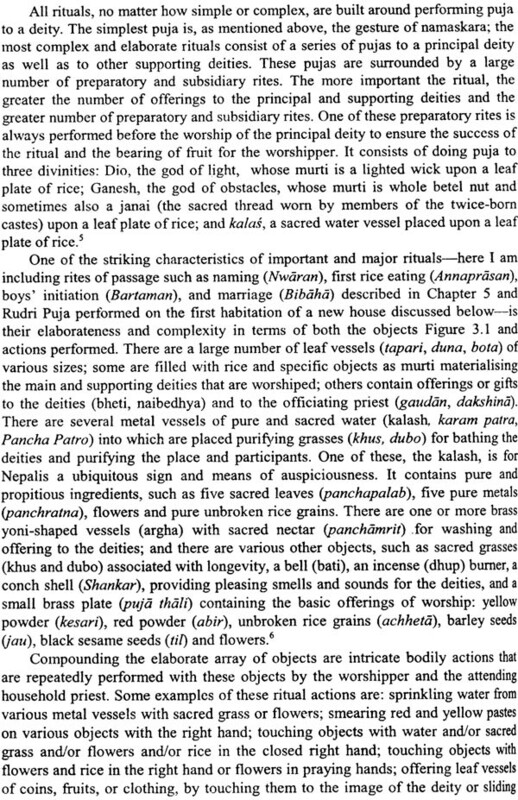 Among the Newars of Patan 'some are wholly Buddhist, others are wholly Hindu, but the majority ... participate in the rites and practices of both religions' (Gellner 1992:5). Similarly, in city of Bhaktapur, Newar clans use both Hindu Brahmin and Buddhist Vajracharya priests (Levy 1990:86-87). While the Parbatiya are clearly Hindu, their religious practices, pantheon and cosmology, like those of the Newar, are infused with Tantrism. Tantrism is one of the most important currents in Indian religious tradition (Goudriaan 1979:5), but as Robert Levy so elegantly stated, it 'is relatively easy to recognize in its manifestations and notoriously difficult to define' (1990:294). Tantrism encompasses extremely varied forms of rites, deities and beliefs whose import is to provide an alternative to the more 'pure' form of Hinduism based upon the Vedas-the primary scriptures of Hinduism, consisting of four collections of verse and ymns. 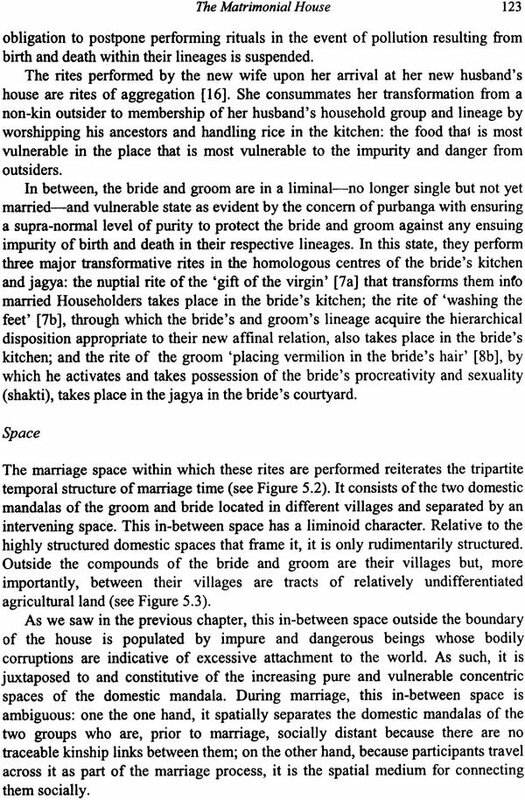 Perhaps the most useful description of Tantrism is given by Goudriaan (1979) who identifies two common dimensions within its diversity. First, Tantrism it its wider sense refers to a set of rituals that generally have a magical character whose aims are to provide a non-Vedic alternative way of achieving worldly aims or spiritual emancipation. 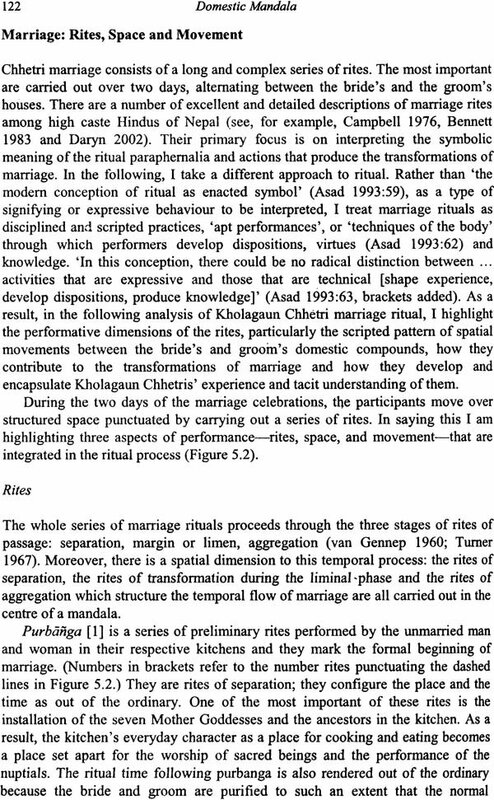 Second, in a narrower sense Tantric rituals are predominantly infused with Sakta symbolism denoting the importance of active female energy in the cosmos (1979:5-6). 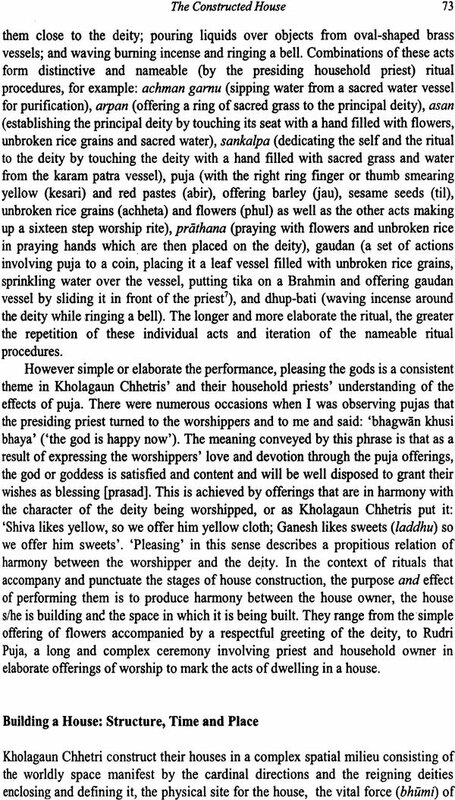 Throughout the book, I will be using the construction 'Hindu [tantric]' to represent the syncretism of Vedic Hinduism and Tantrism that characterizes the religious rites and cosmological ideas that make up the Hinduism that Chhetris of Kholagaun practice. They often described themselves to me as following Hindu dharma (sacred duty). When I asked them to tell me what that meant to them, they enumerated one or more of the following five elements of Hinduism usually associated with the Vedas. First, the most important deities are Vishnu and Shiva, t of the primary gods of the Hindu pantheon. Second, puja [worship] is the principal form of ritual for interactions with the deities. Third, Horn sacrifices involving the offering of vegetal materials to a fire in the centre of a mandala is used in major rites of passage to provide the divine power for transformations being effected. 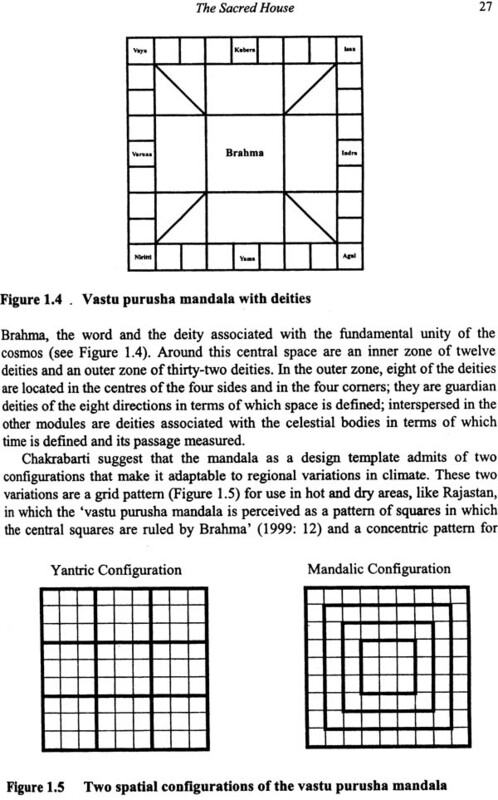 Fourth, life-in-the-world is seen to progress through four stages (ashriima): the celibate student learning the Vedas (Brahmacharya); the Householder (Grhastha) married, raising children, producing subsistence and worshipping the deities; the Forest Dweller (Vanaprastha) retiring from Householder life and performing penances and austerities; and the Wandering Ascetic (Sanyasin) renouncing all possessions and social relations. Finally, humans exist in an everyday lifeworld characterized by a continual cycle of death and rebirth (samsara); the goal of life-in-the-world is to achieve liberation (moksha) from it. Despite this foregrounding of Vedic elements in their self-identification as Hindus, there are also important tantric themes [denoted by brackets] in Kholagaun Chhetris' ritual practices and cosmology. First is the prominence and importance of sakti, the 'universal and all embracing dynamis which manifests itself in human experience as a female divinity' (Goudriaan 1979:7). There are a number of examples of the way in which female divinity is emphasized by Kholagaun Chhetris: the worship of Durga and her victory over evil in the major festival of Dasai; the female deity, Phulchokimai, as their clan goddess; the divinity and worship of chelibeti [divine daughters and sisters] by men; the conception of a wife as a man's shakti (Kondos 2004:7); and the prevalence of people identifying with a person tutelary female deities (istadeota). Second, and inseparable from the importance of shakti, is the dualistic and complementary male-female cosmos in which female energy activates male potentiality. This dualism is personified by the god Siva and his consort Parvati as well as in the more abstract representation of the lingam combining the male phallus emerging out of the female yoni.